Having had these in my possession for a little while now it goes to show just how back logged I am or lazy, whatever suits you. Although it's been products I've been using. 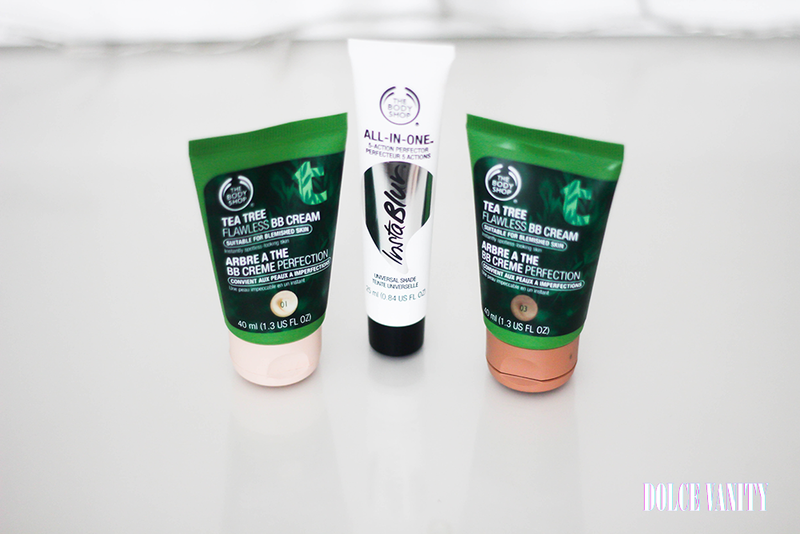 The Body Shop Tea Tree BB Cream comes in 3 shades, light, medium and dark - I have Light & Dark which as per usual, I mix, mix mix! If you've tried any of The Body Shop Tea Tree range then you'll definitely recognise the smell, these creams have it loud & clear maybe not as strong but for some reason when I use it it makes me feel better when putting make-up on that there's an active ingredient (Community Fair Trade tea tree oil from Kenya) within it that's treating my skin while I'm making up my face. 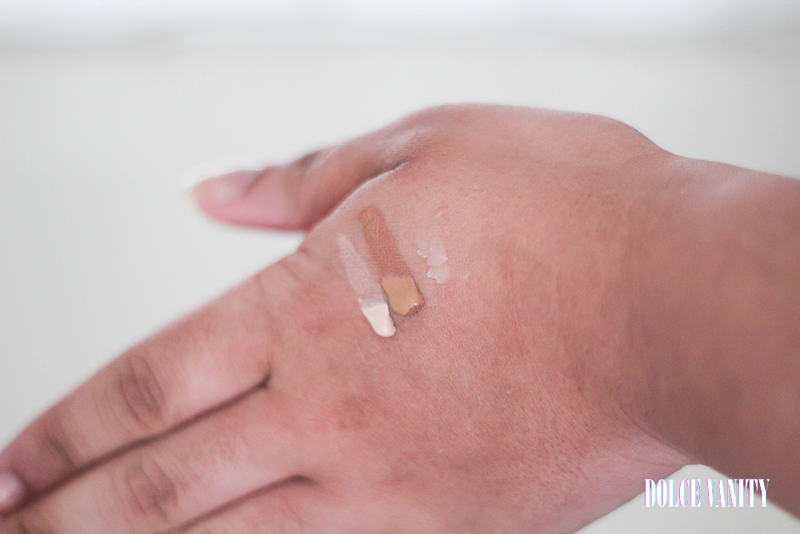 The swatches of them are above - light - medium and the primer. So let's yack on about the primer for a moment, you can see it's a universal shade, one fits all. It's very light and soft. It's there to blur your skin, no retouching just skin on skin. It's pore smoothing and gives more life to your make-up. It says it has 12HR shine control, I don't know about that, I don't wear my make-up for that long to be honest. Contains a 'unique formula of mattifying spherical powders' with smart filling properties & moisturising Vitamin E ( love me some VE) but here's the thing..does it contain any bens or cones? Well no parabens but it's loaded with dimethicone. I counted Dimethicone 4 x out of the 8 (?) ingredients included. Guess that's why you appear like a Gaussian Blur, your coned out! I used them in this look, you'll be bored of these photos now but ah you know what screw it cos it's a lazy day. 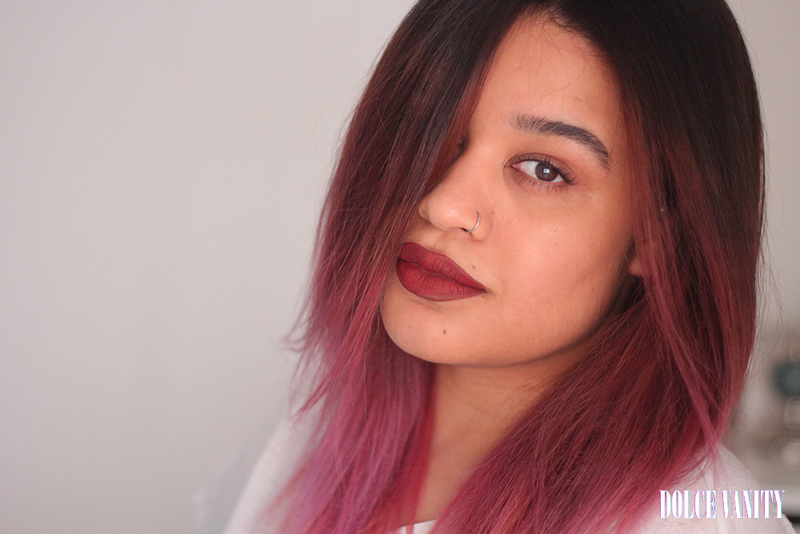 In the photos all I wanted to do was showcase the hair but turned it into a bedroom photoshoot and I reached for the primer and BB cream as a quick & easy combination. As you can see *boom*, that's the face, I didn't bother to use any concealer under the under eyes or to cover any spots as I just wanted to look as close to real as possible. Got to say I quite like the look it gives. Expand the range a bit though TBS be nice that we can all use these BB (treatment) Creams.